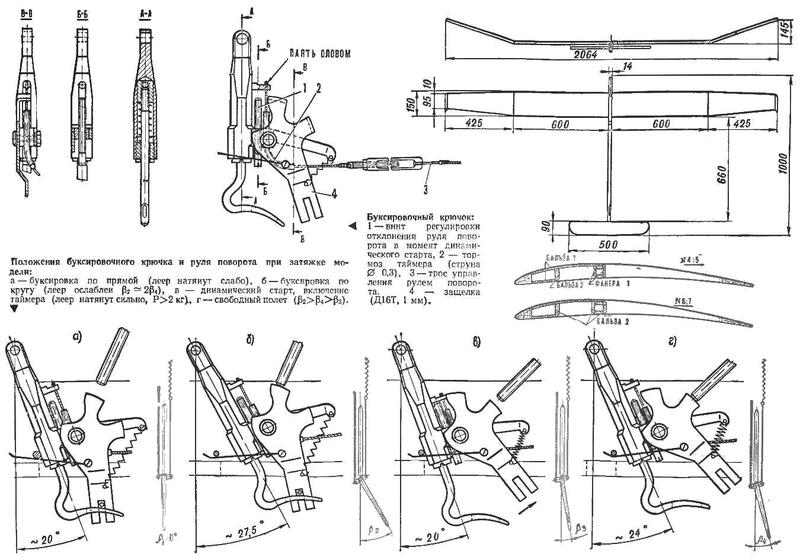 The triumph of the Soviet athlete V. Extencive in the class of models of gliders ended the world championship in 1973. Short nose and a relatively small shoulder are the main design features of the model of a champion. The layout is very different from the standard, which is used by most of our leading modelers. The nose of the fuselage is made from Delta-wood 14 mm thick with density 0.15 g/cm3, which allows more evenly to position the load under the wing. The weight of the forward fuselage is designed to provide the location of the center of gravity of the model at a distance of 55 — 56% from the leading edge. Pins for mounting the wing — wire OVS Ø 3 mm. they pressed the bushings out of steel with a length of 14 mm, with thread M 5X0,5 mm and a rim thickness of 2 mm and 0 8 mm pins are Screwed into the threaded socket on the fuselage. This design allows precisely to fix them in one position and guarantees from turning at the time of the dynamic start. The pins are chrome-plated and are marked “front” and “back”. The tail part of the fuselage — stacked design: upper and lower plates of grained pine, side — balsa. Keel, embedded in the fuselage made of balsa plate with a thickness of 3 mm, the lower part banded with celluloid. 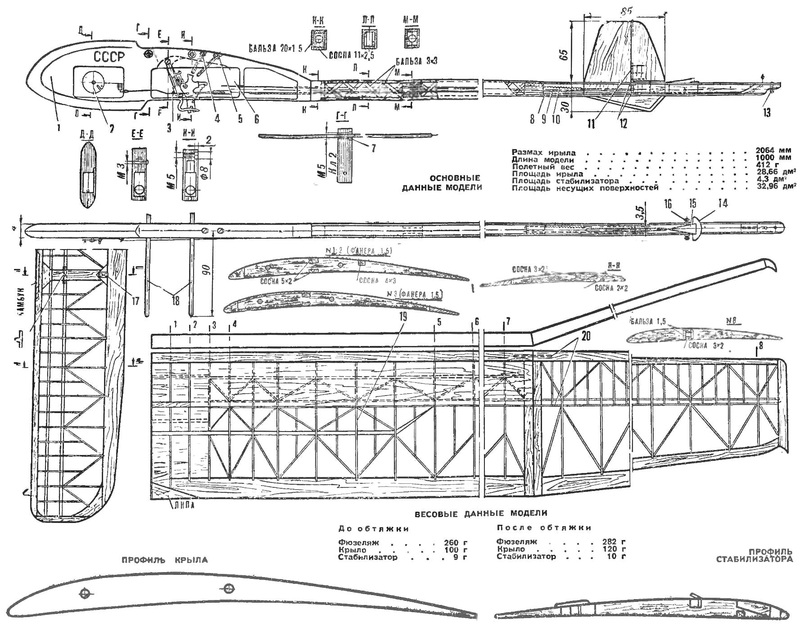 1 — the forward fuselage (Delta wood), 2 — timer, 3 — the emphasis of the tow hook, 4 — adjustment screw turn when towing in a circle, 5 — adjustment screw turn free flight 6 — cover towing hook (D16T, 1 mm), 7 — bushing (steel), 8 — pull determinator (scaffold), 9 — control cable rudder, 10—spring of the rudder 11 — axis rocking (D16T), 12 washers (celluloid), 13 — the screw of adjustment of the installation angle of the stabilizer, 14 — pad for stabilizer (plywood, 1.5 mm), 15 — emphasis (Linden), 16 — pin to rubber for stabilizer (bamboo), 17 — limiter deflection of the stabilizer in parasuraman (celluloid, 1 mm), 18 — pin docking wing (OVS Ø 3 mm, chrome-plate), 19 — ribs (balsa 1.5 mm), 20 squares (plywood, 1.5 mm). The wing in contrast to the steady-state scheme has a smaller length of the center section and larger consoles, which would make it easier. 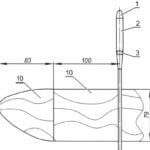 Sophisticated wing design, the presence of bracings offer greater stiffness kochanie, which is very important at the time of the dynamic start. The main power spar — shelf design, variable cross-section at the root and 30% of the length has dimensions 2X5 mm, and at the end of the wing — 1,5X2,5 mm, made of grained pine. Additional spar is made of pine with a cross section of 3X4 mm. Front and rear edges of the balsa; the frontal portion up to the main spar sewn balsa plate with thickness of 1.2 mm. the Main rib of the wing 1.5 mm thickness, made of balsa, edged with Linden veneer of 0.3 mm thick, allowing an accurate profile to handle braces sandpaper. The relative thickness of the airfoil 7%. Edge and rib stabilizer are made from balsa, the spar is made of pine. The main rib banded veneer of lime with a thickness of 0.3 mm. Profile stabilizer — PLANO-convex, with a relative thickness of 6%, provided the bottom of the concavity was 0.5%. The model is equipped with a timer and tow hook for dynamic start, designed for a load of 2 kg. Latch the tow hook allows you to separately adjust the turn when tightening the model and the curve of the free flight that is very comfortable when training. The model is well controlled on the guard rails and has a good performance.